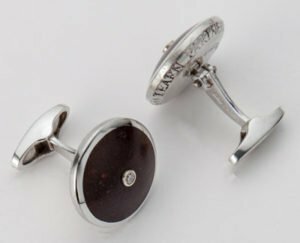 Customers can either choose from a catalogue of items we have in stock or we can make cufflinks, dress studs and tie slides to the requirements of individual customers using techniques which include hand-engraving, painting, tiled or mosaic work and the setting of precious and semi-stones. In consultation with you, we either draw up a design based on your idea or work from an existing design like a logo, crest or letterhead. We then produce the artwork, submit it for your approval, source, where necessary, and cut the materials, and make the finished article. Each bespoke item is hand-made or finished in our Sheffield workshop. We always try to involve the customer as much as possible in the process and visits to the workshop can be arranged by appointment. Hand engraving gives depth and quality which CADCAM laser engraving somehow misses. We only need your letterhead or any picture and we will then make design suggestions to you in either bar link or swivel cufflinks. 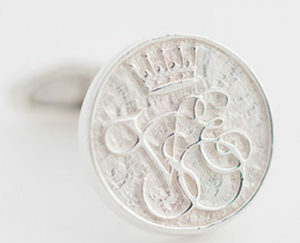 Once the master is engraved, at a ‘one-off’ cost all subsequent cufflinks would be priced at normal cufflink prices. We can engrave family crests, initials, names, coats of arms, mottos, golf clubs, associations or company logos. Please contact us with your suggestion so we can confirm the minimum order required.